One sunny summer’s day three years ago, a small delegation of people stepped out of a run-down military Jeep onto an overgrown field on the Bungenäs peninsula on the Swedish island of Gotland, taking the concept of purchasing property sight unseen to a whole new level. 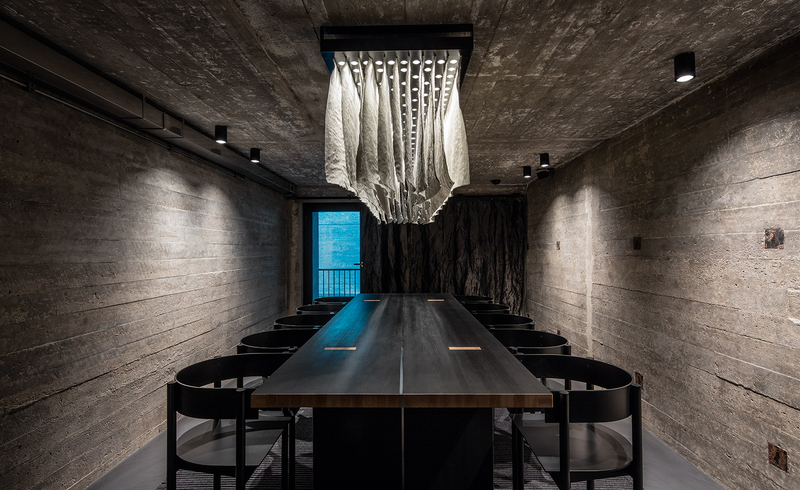 There, equipped with a torn, faded piece of paper – a formerly classified architectural plan of the subterranean bunker that lay underneath their feet – architect Erik Gardell shared his vision for the plot of land. ‘I was completely caught off guard when the potential contractor, whom we had just met the day before, said “Let’s just do it!”’ says Gardell. ‘There really was nothing there not even a trace of the bunker. But the client’s deep interest in the area prompted him to go ahead with the acquisition, giving us the mind-boggling task of converting the bunker into a second home for him and his family. I never thought this bunker, which was said to be considerably larger and deeper than any other here on the peninsula, would be put to good use. The bunker, named Building 104 at its conception in 1937, used to be part of a 160-hectare area that the Swedish army used to protect the Fårö Strait. The Bungenäs territory had been off limits to the general public until 2007, when local entrepreneur Joachim Kuylenstierna bought the former army site and initiated its reincarnation. His father had been part of the military based there, so he has always felt a connection to the land. His acquisition inspired the creation of local architectural firm Skälsö Arkitekter (of which Gardell is a part), which headed the development of an architectural master plan for the area. The long term plan, which took as its starting point the many defence system remnants found around the peninsula, above and below ground, encompasses 130 plots of land and is determined on retaining the site’s unique history and character while creating a close-knit, freethinking community of restaurants, bars, galleries and holiday homes. Before starting on an architectural plan for Building 104, the entrances to the bunker had to be excavated. ‘All we had to go on was one of the Swedish Fortifications Agency’s old drawings, which indicated an open three-level underground structure’, says Gardell. ‘Once inside, we found that the bunker was filled to the brim with gravel and water. This was left after the demilitarization of the area, as no one was ever meant to be able to enter these facilities in the future. Once all the debris was cleared away, the team spent time examining its 15m-deep cylindrical pit (which used to hold a Bofors 15.2cm M51 cannon) and its adjoining spaces. ‘Taking into account our client’s fascination with the area’s heritage, we didn’t want to cover up or conceal any clues to the bunker’s former use. Instead, we were fascinated by the thought of incorporating these features into a residential project,’ explains Gardell. Today, the 320 sq m original bunker and one of two new overground additions house two kitchens, two living rooms, a dining room, an office, several bedrooms and bathrooms, and a spectacular spa area. 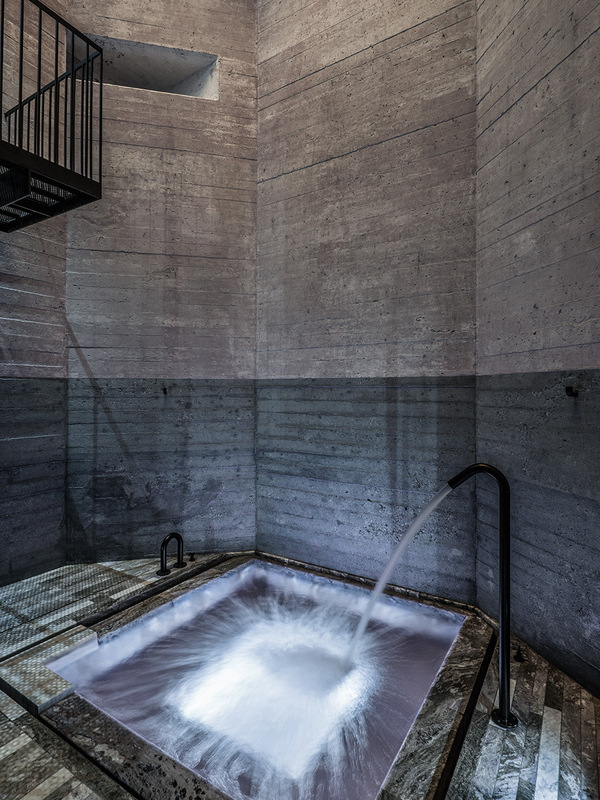 The latter features a small pool, two saunas and a lounge, situated at the bottom of the bunker pit. ‘A building like this is often perceived as cold and hard,’ says Gardell. ‘But with the air temperature turned up and the water in the pool heated, it conveys quite the opposite feeling. From below, the sky above as seen through a round skylight gives a sense of an inverted sacred space. The other overground addition, an annexe, is situated across a trench-inspired courtyard and was added to provide generous accommodation for guests. ‘Despite adding an extension, we haven’t forsaken the original concept of a bunker. We were inspired by the bunkers along the Normandy coast, which seem to rise up out of the ground just as the sea erodes the land around them. For this reason, no traditional roofs were added to any of the structures protruding from the ground. For sun-deprived Swedish holidaymakers, the proximity to nature and natural light plays a crucial role in country living. For the bunker, making the most of any available light was key. Inspired, again, by military architecture, slim, vertical, bevelled openings were arranged in a row, for the dramatic transmission of light, both inside and out, and the sense of a concrete structure emerging from the underground. 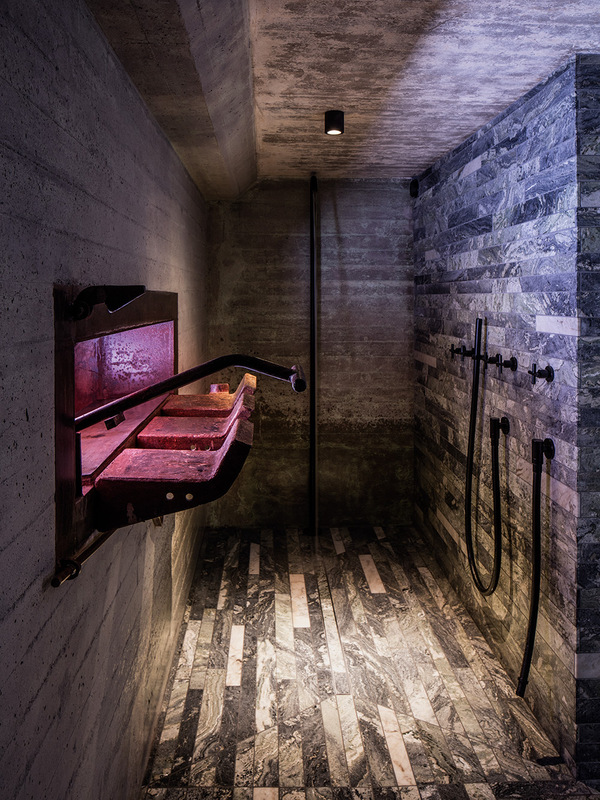 Inside, Skälsö Arkitekter refrained from making the interiors too cosy or domestic – instead, the studio took its cues from 1960s business settings, using larch wall panels and doors, terrazzo floors and stainless steel to play on the bunker’s Cold War credentials. To avoid compromising on its original vision, Skälsö Arkitekter also set up its own construction company. ‘Architects can sometimes blame any shortcomings on either the construction company or on the client. But in this case, we were fully in charge of all construction and we had a client who was on board with all of our crazy ideas – which made us want to push the boundaries even further. This time, we have no one else to blame but ourselves for the result.